I was pony mad as a child and vividly remember the trials of being a young rider (albeit a fairly experienced one) with a highly-strung competition pony. He was used to hacking in the Welsh hills and if I dared take him on the road he would leap spectacularly into the air, akin to a Lipizzaner. I was about 14 at the time, but looking back now, and with experience as a lawyer, I realise what folly it was to go out on the road on that type of pony, without greater forethought. Particularly as this was before the time of riding hats with secure chin straps and the common use of high-vis gear and head cams. A number of years later I have returned to live in the same village I once rode around care free, and the increase in the volume and speed of traffic is startling. Unfortunately many drivers don't know how to pass horses safely on the roads, which means riders are putting themselves in danger every time they saddle up and venture out for what is supposed to be an enjoyable part of life. I now spend more time helping injured horse riders than I do riding myself. By offering the following tips on how to stay safe hacking on the roads, I hope to prevent further accidents. National statistics show that for every 1,000 rides, 37 end in some sort of injury to the rider. There is no denying it can be a dangerous activity, yet few people invest their time in a well thought out training plan that will gradually and safely expose their horse to the issues they face on the road. You can easily recreate some typical hacking scenarios within the safety of your arena to get your horse used to hazards, such as plastic bags or walking through narrow gaps. Another vital way of reducing the risk of an accident is to think carefully about the weather conditions and traffic volumes. Having to postpone or cancel a ride may be disappointing, but it is preferable to suffering a bad fall. • Avoid busy periods of the day, such as commuting times or school runs. If there are local bus routes, learn what times they are out and about. Similarly, don't step out on the roads on bin day if your horse is frightened by large, noisy vehicles. • Take a rain check if weather conditions are bad - for example, in high winds, heavy showers, snow, ice, fog or in blinding sun. Consider when the sun may be low and interfere with a driver's vision, too. • Check your route to avoid road works and known hazards - some useful websites that contain this information are www.trafficengland.com and www.traffic-wales.com. • Make sure your riding equipment is in good working order. Check the girth is tightened sufficiently, for example. • Take your mobile phone, switched to silent, and have an In Case of Emergency (ICE) number stored in it. • Attach a tag to your horse's saddle or bridle with an emergency contact number, in case you get separated for some reason. • Equip yourself and your horse in high-vis gear. Research has shown a driver travelling at 30mph has three valuable extra seconds of reaction time if a rider is in hi-vis. You can't be held responsible if you don’t wear any, but you might prevent an accident if you do. • Wear safety equipment, such as a wellfitted riding hat. A body protector is also recommended, particularly if you are riding a young or spooky horse. Surprisingly, there is no legal requirement to wear a hat. However, if you suffer a head injury which could have been avoided or lessened with the use of appropriate safety equipment, any compensation you might be awarded in a legal case could be reduced to reflect your contributory negligence. Accidents often happen when you least expect them. You may have ridden along the same stretch of road hundreds of times, on the same horse, without incident. But then, on one particular day, something goes wrong, and because your reins are long or you're not concentrating you lose control of your horse. Being complacent increases your risk of an accident, so be aware of your surroundings and be in control of your horse at all times. With a new horse, or a youngster, you should expose them to traffic in a gradual and controlled manner. Don't just head off onto the roads and hope for the best. You can introduce stationary cars in a safe place on the yard, and then ask a friend to drive slowly past, for example. While not everyone has a hacking out partner, the preference is to always ride in company, especially if you have an inexperienced horse. Out on the roads, treat drivers with respect and thank them if they slow down and pass by with care. The aim is for everyone to share the roads safely and responsibly, and this will encourage drivers to slow down and pass wide in the future. One of the things that can annoy drivers is when riders are two abreast. You have a legal right to do this, as is set out in the Highway Code, and it is a sensible move if you have a young or inexperienced horse. However, where the road is narrow, or you have a car behind you and there is somewhere safe for them to pass, consider going single file. If a driver is faced with horses two-abreast on the road in front of them, it may put them in a position where the only way they can go past you, without hitting another car, is to accelerate past at speed - and they will probably rev their engine at the same time. This will be more spooky for your horse than a car going past slowly. Hat and head cams: Use of a hat cam can provide indisputable evidence which may prove useful if you are involved in an accident - either to defend an allegation that you caused it, or to prove someone else did. A solicitor will be able to utilise such evidence in any civil claim and the police or Crown Prosecution Service (CPS) might use it too, but that would be at their discretion in any criminal proceedings. If a vehicle passes by in a dangerous manner, you could use the footage to report it to the police, or employers if it is a corporate vehicle. The CPS may be able to use it to prosecute them, or your hat cam evidence might make them think twice next time they pass a horse and rider. Warning tabards: Tabards with warnings such as 'Young Horse' may seem like a good idea, but they require a cautionary note. If you go out on to the road on a young horse and feel the need to make this known to drivers, it could be used as evidence against you. 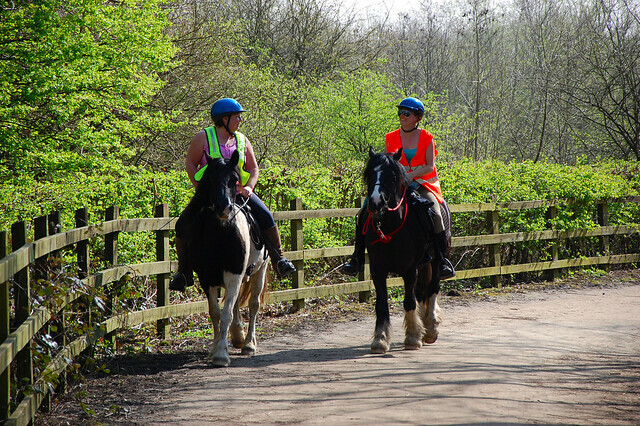 If the horse's lack of experience/age causes an accident or significant damage, the fact you are wearing a tabard, warning other road users, may actually work in the driver's favour, due to wording of the Animals Act. However, wearing a tabard is not in itself an admission of liability. If you are wearing a hi-vis bib and a driver comes past you too fast and too close, causing the horse to be spooked and you to fall, they would most likely still be found at fault, irrespective of a tabard saying 'novice horse'. How can we reduce riding casualties? There is always a duty on horse riders to act responsibly when on the road. I have seen cases reported where - despite it being held that a motorist caused an accident - the rider was found equally to blame for riding in an unsafe manner. There have even been cases where a motorist has successfully sued the rider for damage to their car. Simple steps taken by the rider can minimise risks. 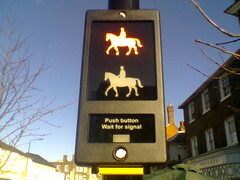 Selecting your route, ensuring your horse is prepared, and communicating with other road users, can go a long way in ensuring a safe ride. Likewise there is a duty on motorists to drive safely, to slow down and to give adequate clearance to riders. Even the most minor collision between a vehicle and a horse could have life threatening consequences for rider and animal. Ultimately, I believe better driver education is the key to improving safety, as road users shouldn't turn into bad drivers simply because they need to overtake a horse and rider. Driving tests should focus more on dealing with horses, while qualified and experienced drivers also need to be reminded of best practice when dealing with horses on the road. The British Horse Society has various leaflets and posters available about this. Placing them in shops or community noticeboards around the places you ride could help bring this guidance to the forefront. With sensible attitudes and careful behaviour we should be able to share the roads, and in doing so ensure riding remains the safe pleasure it always has been.